Luther Slater is the only commissioned Union officer from the Civil War who is buried in Lovettsville. He was the highest-ranking elected officer in the Independent Loudoun Rangers, and but for his serious and disabling wounds, he almost certainly would have become its commanding officer over time. 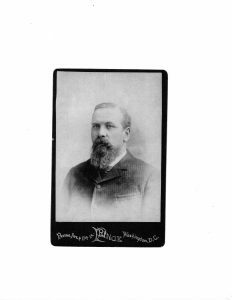 After the Civil War he served as Lovettsville postmaster for two years, and then accepted a position in the War Department in Washington, where he remained for over forty years, first in the medical corps, and then as a top official in the Records and Pension Office. Here is his story – an updated version of a lecture given to the Lovettsville Historical Society on August 14, 2011. Luther Washington Slater was born in the area of Slater’s Crossroads – on what is now Slater Lane — near Lovettsville, on October 2, 1841. His great-great-grandfather Johannes Jacob Schloetzer (1709-1770), and his great-grandfather of the same name, emigrated to Pennsylvania in 1754 from the Rhineland Palatinate (Rheinland-Pfalz). The family next appears in the records of Augustus Lutheran Church in Trappe, Pennsylvania – the church congregation headed by the Rev. Henry Muhlenberg, regarded as the Patriarch of American Lutheranism. Luther’s great-grandfather Jacob Slater (1729-1815) came to Loudoun County sometime between 1763 and 1766. In 1756 he had married Susanna Habicht, the widow of Casper Spring who was killed in the French-Indian War. (She had two sons from her first marriage, Andreas and Frederick Spring, who came with Jacob and Susanna to Loudoun County, and who are the founders of the Spring family in the Lovettsville area.) This Jacob Slater is recorded as having provided Patriotic Service during the American Revolution, by supplying beef to the Revolutionary Army. Luther’s grandparents were John Slater (1763-1824) and Catherine Souder Slater (1772-1807), and his parents were Samuel Slater (1807-1898) and Barbary Myers (1808-1854), who were married in 1827. Samuel inherited his father’s farm. They had eight children, of whom Luther Washington was the seventh. The Slaters were among the earliest members of New Jerusalem Lutheran Church near Lovettsville. Luther was baptized on May 6, 1842, and was confirmed in the Lutheran faith on May 28, 1854, and the records show him taking communion regularly during the periods he was at home. He probably attended the Tankerville School, which preceded the 1866 establishment of Bethel Lutheran Church at Tankerville by about two decades. In 1859, young Luther Slater enrolled in the Preparatory Department of Roanoke College in Salem, Virginia, which was founded as the Virginia Institute in 1842, to prepare boys for enrolling in Pennsylvania (Gettysburg) College and the Gettysburg Lutheran Seminary. 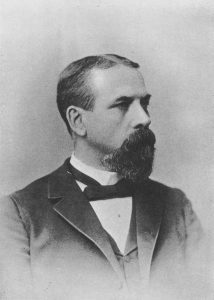 During the following school year, 1860-61, Slater was enrolled in the Preparatory Department of Pennsylvania College at Gettysburg, until his studies were interrupted by the outbreak of the Civil War. He was a member of the Phrenakosmian Society, a literary organization. His course of study would suggest that he was preparing to enter the Lutheran Seminary at Gettysburg and to become a minister. The Civil War decisively changed his course. 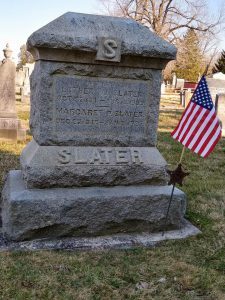 From 1862 forward, Slater devoted his life to the service of his country – for the most part in the service of the United States Army and the War Department. In June 1862, Samuel Means, a mill owner in Waterford, was commissioned as a Captain in the U.S. Army, and was authorized by the Secretary of War to recruit loyalists in northern Loudoun County to the Independent Loudoun Rangers, a cavalry and scouting unit in the service of the United States.ii Luther Slater and about two dozen others were mustered in on or about June 20, 1862, at either Lovettsville or Waterford; accounts differ.iii In early July, the Rangers encamped at the Reformed Church at Lovettsville — just outside of town, in what is now the German Reformed (St. James) cemetery. There, Capt. Means held elections for the other officers of the company; Slater was elected First Lieutenant, the number-two position in the unit. At the beginning of August, the Rangers moved back to Waterford, where they learned the rudiments of military practice under the direction of their temporary drill-master, Charles Webster. After the arrival of their uniforms from Harpers Ferry, they undertook more active scouting. According to Briscoe Goodhart’s not-necessarily accurate, but always impassioned, account of the Loudoun Rangers, Lt. Slater had been absent for several days sick, but returned to camp at the Waterford Baptist Church on the evening of August 26, 1862. Because of the small number of men in the camp – only about 20, with half being new recruits – the First Sergeant was having difficulty mounting the guard. Slater, “a very popular officer” according to Goodhart, saw the sergeant’s predicament, and cast himself into the breach, acting as corporal of the guard, as well as Officer of the Day. At about 3:00 in the morning of August 27th, Maj. Elijah V. White’s 35th Battalion, Ewall’s Brigade,Virginia Cavalry, having dismounted and made their way across the fields undetected, reached the Rangers’ camp. Hearing an unusual noise, the men rushed out of the church, and Slater hastily formed them in line. Slater’s command: “Halt, who comes there” was met with a volley of shot, which wounded over half of those in front of the church. Meanwhile, in late November 1862, being partially recovered from his wounds, but still considered unfit for field duty, Slater was appointed as the U.S. Provost Marshall at Point of Rocks, Maryland. By this time, those Rangers who had surrendered and were paroled at Waterford, had been exchanged and returned to duty. Slater’s extensive knowledge of the area rendered him capable of determining who should be permitted to take goods through the blockade. Taylor Chamberlin’s book Crossing the Line reports that, in his capacity as Provost Marshall, Slater served under Col. Lafayette Baker, a colorful character who was the Provost Marshall of Washington, the head of the National Detective Police, the de facto head of counter-intelligence for the federal government, and the founder of the U.S. Secret Service. On February 16, 1863, Slater submitted his letter of resignation, and on February 19, 1863, he was discharged from the Army because his right arm was completely disabled, and, according to a military surgeon, he would not be able to resume his duties. In June of 1864, Slater was granted a disability pension for “GWS” (gun-shot wound) of the right arm, in the amount of $8.50 a month. Meanwhile, having returned to Gettysburg and still recovering, Slater responded to the emergency calls issued on June 15, 1963 by President Lincoln and by Pennsylvania Gov. Andrew Curtin, for volunteers to repel the Confederate invasion which was coming up into Pennsylvania from the Shenandoah Valley. The defense of Harrisburg was the top priority of Gov. Curtin and Gen. Darius Couch, the newly-appointed commander of the Department of the Susquehanna of the Army of the Potomac. Despite the fact that his arm was still in a sling, Slater reenlisted on June 16, and was commissioned a 2nd Lieutenant in Company A of the 26th Emergency Volunteer Regiment, and helped to lead a newly-enlisted group of students in attempting to delay the Confederate troop movements. Company A was in fact the first unit to be formed in response to Lincoln’s and Curtin’s call; it was initially composed of 61 young men from Pennsylvania (now Gettysburg) College and the Lutheran Theological Seminary, and 21 men from the town of Gettysburg. Other enlistees in Company A were Cpl. David Yount (Slater’s future brother-in-law), Samuel Pennypacker (later Governor of Pennsylvania), and H.M.M. Richards (grandson of Henry Melchior Muhlenberg), who later graduated from the U.S. Naval Academy, led the Pennsylvania German Society and other historical societies, and wrote extensively about German-Americans in the French-Indian War and the Revolutionary War. The Gettysburg students were mustered into the Union Army in Harrisburg, underwent but a few days of rudimentary training, and on June 23, were deployed with the 26th Regiment, numbering 743 men, to Gettysburg. Other volunteer regiments were deployed to protect the railroads in York County, and the bridge crossing the Susquehanna at Wrightsville, south of Harrisburg (where present-day U.S. Route 30 crosses the river between York and Lancaster). On June 26, as the young men of the 26th were positioned west of Gettysburg along the Cashtown (Chambersburg) Turnpike and adjacent roads, along came Jubal Early’s Division of Ewell’s Corps. approaching from the west. On that morning, Early sent a brigade of Georgia infantry and a battalion of Virginia cavalry down the turnpike toward Gettysburg. In the van was Elijah White’s 35th Va. Cavalry. When White’s experienced cavalry met the green militia volunteers, it was no contest. The regiment scattered and ran; 175 were taken prisoner. There were no deaths. The previous days’ experience in routing the green militia forces contributed to the over-confidence of Confederate leaders and the June 30 decision of Gen. Henry Heth to attack Gettysburg, in belief that he would only be facing inexperienced militia troops. As they headed toward Gettysburg in search of shoes and provisions, Heth and his men assumed that the troops that they spotted on the ridges west of town were mere militia soldiers. It was surely an “uh oh” moment, when Heth’s troops realized they were facing regulars of the Army of the Potomac – and the Battle of Gettysburg, the turning point in the War, was on. What was Slater doing for the rest of the war? According to a notation in his service records, he was detailed to the Signal Corps by Maj. Gen. D. N. Couch, the Commander of the Department of the Susquehanna. A Gettysburg college history says that three men from Co. A were detailed to the Signal Corps: two of them being Luther Slater and his future brother-in-law, Cpl. David Yount. Slater’s service records show him being mustered out of the regiment on July 30, 1863. One of Slater’s obituaries (the Washington Herald) stated that he served in the Hospital Corps for the remainder of the war. Cavalry officer, Provost Marshall, Signal Corps, Hospital Corps: Slater was a versatile individual. We know not exactly all of what he was doing during the last two years of the war, but judging from the impressive collection of those writing letters of recommendation for his appointment as a hospital steward in 1867 (see below), he somehow had established connections with a number of senior Army flag officers. In November 1864, Luther married his “guardian angel” Mollie Yount at Gettysburg, with Prof. F. A. Muhlenberg officiating. They had their first child, Effie, in September 1865. By the Spring of 1865, Slater and Mollie had returned to Lovettsville. On June 1, 1865 – the first post-war election in Loudoun County — he was elected one of four Constables for Lovettsville. Then on July 3, 1865, Luther Slater was appointed as Postmaster in Lovettsville, a political-appointment which he held until April 9, 1867. Brig. Gen. John W. Geary: then-Col. Geary occupied Lovettsville and northern Loudoun County in February 1862 for about a month; was greeted with enthusiasm in Lovettsville and northwest Loudoun, but received a less-than-warm welcome in Leesburg. Maj. Gen. Benjamin Butler: well-known politician and Union General; occupied New Orleans and Norfolk, action during the siege of Petersburg; before war, was in Massachusetts legislature; after the war, was a five-term U.S. Congressman, and then Governor of Massachusetts. United States Senator Waitman T. Willey: Unionist Senator from Va. July 1861-March 1863; elected Senator from W. Va. in 1863 as a Unionist; Republican Senator from W. Va. 1865-1871. Slater photograph found in the photo files of the D.C. Commandery of the Military Order of the Loyal Legion of the United States (MOLLUS), maintained at the U.S. Army History and Education Center of the Army War College, Carlisle, Pa.
Slater seems to have accepted this designation. In his initial application for membership in the Military Order of the Loyal Legion of the United States (MOLLUS) in March 1892, he listed his service as with the “Co. A., Loudoun Rangers, Va. Cav.” but then by October of that year, he is listed as “Independent Battalion, West Virginia Cavalry.” The West Virginia Cavalry designation for Slater remained in use up through the MOLLUS circular published at the time of his death in 1909. As we noted, Luther and Mollie Slater had moved to Washington City in the fall of 1867 (his uncle William Slater and cousins Isaac and William Slater were already living there). In 1871, tragedy struck. Mollie gave birth to their second child, a son David, on April 8, 1871. She died about seven weeks later, on June 3, in Washington, and the infant David died nine days later, on June 12. 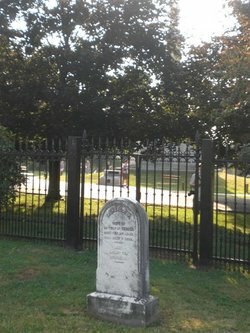 Mollie and her infant son are both buried in Evergreen Cemetery in Gettysburg, in the shadow of the monument commemorating Lincoln’s Gettysburg Address. Three years later, Slater re-married, to his cousin, Margaret Prentice Slater. A few years after that, he built a handsome brick house at 442 New Jersey Avenue, S.E. in Washington, next to a home built by Isaac Slater a few years earlier. Both houses are still standing today. In Washington, Luther Slater was a founding member of the Lutheran Church of the Reformation on Capitol Hill, and he was probably instrumental in obtaining, from the War Department, use of an old Army barracks as Reformation’s first place of worship – located at the site of the present-day Capital South Metro station. Worship began in the old Barracks building in May 1869, although Reformation’s founding members had been meeting as early as 1866 or 1867. The congregation was formally organized with a pastor appointed in October 1869. “Captain and Mrs. Luther W. Slater” are listed first among the names of those associated with the church at this time; also listed is his brother-in-law David Yount, Luther’s uncle William Slater, and uncle William’s sons I.C. (Isaac) Slater and William F. Slater. Slater served as an elder and a trustee of that church, and also as the congregation’s treasurer and Sunday School Superintendent. He was forced to resign from the latter position in 1875 because of a “weak throat.” He also served on the Farming Committee of the Lutheran Home for the Aged. Around 1880, Reformation appointed a Building Committee to look for a new church home to replace the old Barracks church. Luther Slater was appointed to that committee. In January 1881, the church purchased a property at Pennsylvania Avenue and B St., and a new church was built there, which was dedicated in 1883. That building served the congregation until 1933, when it was demolished to make way for the expansion of the Library of Congress and the construction of the Adams Building, with the new church building being located on East Capitol Street, across from the Folger Shakespeare Library, where it stands today. During 1907, “A brass pulpit was dedicated in the memory of Mr. I. C. Slater, elder and Sunday school superintendent,” and somewhat later, “A brass lectern was presented in memory of Mr. L. W. Slater, elder and Sunday school teacher,” according to a church history. Portraits of Luther and Isaac Slater were located at the church in 2012 through the efforts of Mr. George Hutchison, and after their discovery, they were hung in the church’s fellowship hall, having been “restored to their rightful place,” in Mr. Hutchison’s words. The portraits are now on display in the church library. Slater was also a founding member of the Freedom Lodge No. 118 of the Masonic Order in Lovettsville right after the Civil War, and served as its Secretary from 1965 to 1967. Its founding members were almost all Unionists. In 1888, Slater was listed as a member of St. John’s Lodge No. 11 in Washington, D.C., and he was also a member of the Masonic Veterans Association at that time. He does not appear to have remained active in the Masons or the Veterans Association. In 1892, Slater was received into the Military Order of the Loyal Legion of the United States (MOLLUS), the organization of Union officers who had served in the Civil War. He was elected to membership as an “original companion” of the District of Columbia Commandery of the Loyal Legion on December 7, 1892, and remained a companion for the rest of his life. Slater was buried in Lovettsville Union Cemetery, along with his second wife Margaret, his daughter Effie Hickman from his first marriage, and his grand-daughters Louise Hickman and Clara Hickman. 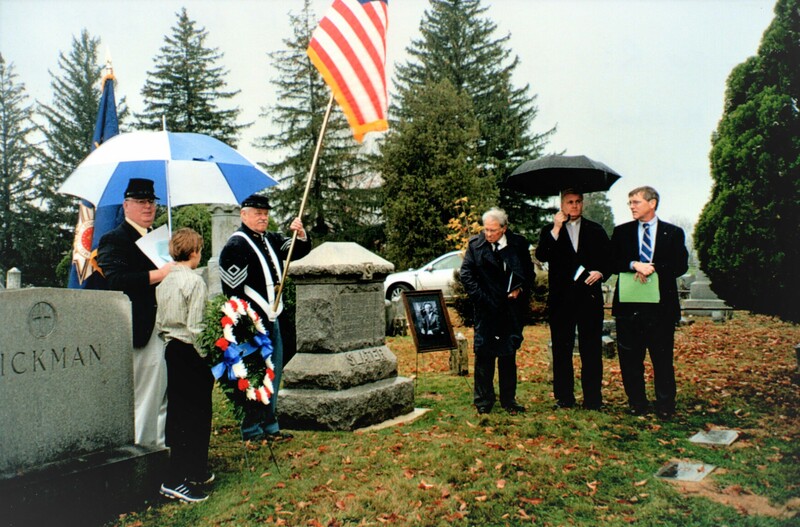 In November 2008, the Military Order of the Loyal Legion honored Luther Slater by sponsoring the repairs and the rededication of his gravesite monument in Lovettsville Union Cemetery. 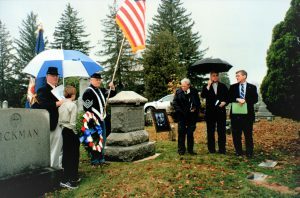 i Two other commissioned officers in the Loudoun Rangers, Charles F. Anderson and Robert Graham, are buried in Waterford. All the other Union officers, including Loudouners who served in the Potomac Home Brigade, are buried out-of-state. ii Primary sources on the Loudoun Rangers are records of the National Archives. The most important secondary sources are (1) Briscoe Goodhart’s 1896 History of the Independent Loudoun Virginia Rangers, (2) the thoroughly researched and documented 2011 account by Taylor M. Chamberlin and John M. Souders, Between Reb and Yank: A Civil War History of Northern Loudoun County Virginia, and (3) Lee Stone’s The Independent Loudoun Rangers: The Roster of Virginia’s Only Union Cavalry Unit (Waterford Foundation 2016), with Forward and Appendix by Edward Spannaus. iii Slater was one of 28 members of the New Jerusalem congregation to enlist over in Company “A” of the Loudoun Rangers, according to research done by the late Pastor Mike Kretsinger. iv Interestingly, both Elijah White and Luther Slater had also attended church-sponsored colleges out of state. White first attended Lima Seminary in western New York, a Methodist school which eventually evolved into Syracuse University. He then spent two years at Granville College in central Ohio (an area into which many Loudouners had transplanted themselves). Granville was a Baptist college which later became known as Denison University. In the pre-Civil War period, Granville College was a hotbed of anti-slavery sentiment – which probably would not have been to Elijah’s liking. It is likely that Slater and White were the only two men at the Waterford fight who had been to college, and, given their course of study, it is possible that both were originally preparing to enter the ministry. v Mollie (Mary Ann Elizabeth) Yount was the daughter of Israel Yount, the proprietor of the Washington House Hotel in Gettysburg. Today the Lincoln Diner occupies the site of the old Hotel. vi Gettysburg was not a major objective of the Southerners. The CSA plan was only to obtain supplies in Gettysburg (particularly, shoes), then to cut the railroad at York, and then to proceed toward Harrisburg both from the west, and also from the southeast via York and Lancaster. to prepare the way for the capture of the state capital, on the way to Baltimore and to Washington (or, as Dennis Frye, chief historian at Harpers Ferry National Park suggests, Philadelphia). vii Gen. Ainsworth was also known for his confrontation in 1911 with Army Chief of Staff Leonard Wood and Secretary of War Henry Stimson, which resulted in Ainsworth being court-martialed. 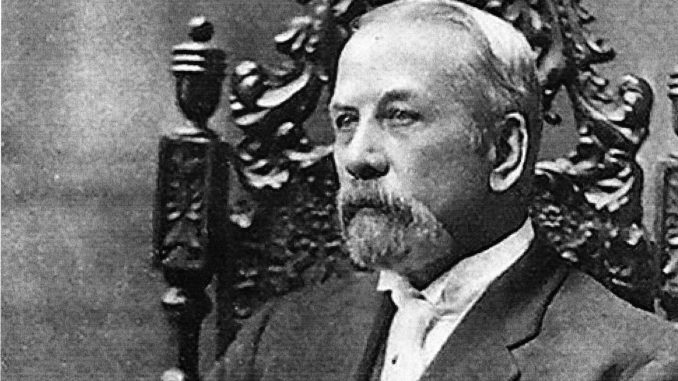 Ainsworth was a leader of the “traditionalist” faction within the Army and the War Department, who resisted the reforms championed by Secretary of War Elihu Root which resulted in the creation of a General Staff in 1903. Under the reorganization, the functions of the Adjutant General’s office and the Record and Pension Office were combined in 1904 under the new Military Secretary, who was Ainsworth. In 1907 Congress restored the Office of The Adjutant General (OAG), with Ainsworth as its head. Slater, as a top aide to Ainsworth, stayed with him during these various reorganizations. viii The records of the “office muster in” are found in Slater’s Volunteer Service file at the National Archives: 1110 V.S. 1883, Record Group 94, Entry 476; Walz 186 – ‘67, filed with W 463 – V.S. ‘62. ix Records of the Adjutant General of West Virginia. For more on West Virginia’s relation to the Loudoun Rangers, see “The Strange Case of the Disappearing Cavalry Captain” in the Lovettstville Historical Society newsletter, September 2018.
x Despite extensive efforts, the author has been unable to locate a copy of this address. Luther W. Slater monument, Lovettsville Union Cemetery. Our April 2019 Newsletter is now available!